This is one of two legendaries (the other being Prydaz, Xavaric's Magnum Opus) that can drop for and be used by ANY class. I obtained this ring June 7th, 2016 on the beta from a Highmountain Tribute. As of right now it's possible to obtain as loot from the daily world quest faction turn ins. Looting the legendary shouted in guildchat "x has received !" This doesn't seem to be triggered by other item effects, such as the stun from The Devilsaur's Bite. It would have helped make this item way more useful for classes with longer CD on their stuns than the rings internal cooldown. The strength of this ring is immeasurable if you spec into Tremble Before Me. Essentially the uptime is 100% for trash packs and as someone else commented, "...like a wee Heroism/Lust every 30 seconds". I witnessed the shield provided by Umbilicus Eternus reach 2MM allowing a faster pace and larger pulls with greater confidence. It's definitely not our best legendary, but nothing to scoff at either and has it's niche uses like Withered Army Training. This is probably a bug, but ring procs from getting auto-dismounted from Ratstallion Harness when you attack something. The Blood Elf racial Arcane Torrent triggers it if it manage to silence something. The haste buff procs from Capacitor Totem and the knock down effect of Earthquake. That (and the stats) makes it a very decent ring for mythic+ dungeon content for elemental shamans. Tremble Before Me - Blood talented incapacitate. This procs constantly on trash providing maximum uptime and is very powerful in mythic+ dungeons. Does not work on bosses, even though DnD does hit them. Winter is Coming - Frost talented AE stun. Does not work on bosses, even though RW does hit them. Bosses cannot be stunned or incapacitated, but abilities like Gnaw that also deal damage as part of the same effect will proc Sephuz's Secret. This procs from Ember of Nullification. Mass Dispel - Baseline AE Dispel, both enemies and friendlies. Only if it successfully dispels magic from a target. Dispel Magic - Baseline enemy Dispel. Only if it successfully dispels magic from an enemy. Purify - Disc/Holy friendly Dispel. Only if it successfully dispels magic from a friendly. Silence - Shadow baseline Silence/Interrupt. Works on bosses only if the interrupt is successful or the silence effect applies. I got this from a Blingtron 6000 Gift Package. Was quite surprised lol. Also triggered by War Stomp. I will miss this ring. 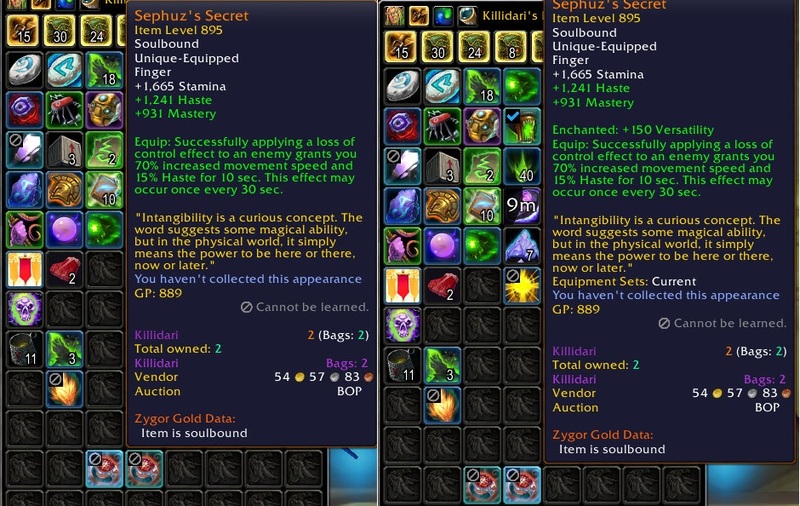 As a paladin that has raided on all three specs, I soon discovered that pairing my high crit healer value with this ring and Aggramar's Stride gave me a 55% speed boost when walking. I then understood that shockadin was the spec to do previous content. Going through old dungeons and raids at 1,5 speed was really noticeable. I will keep this legendary combo in my void storage as a memento of glorious "Gotta go fast" days.